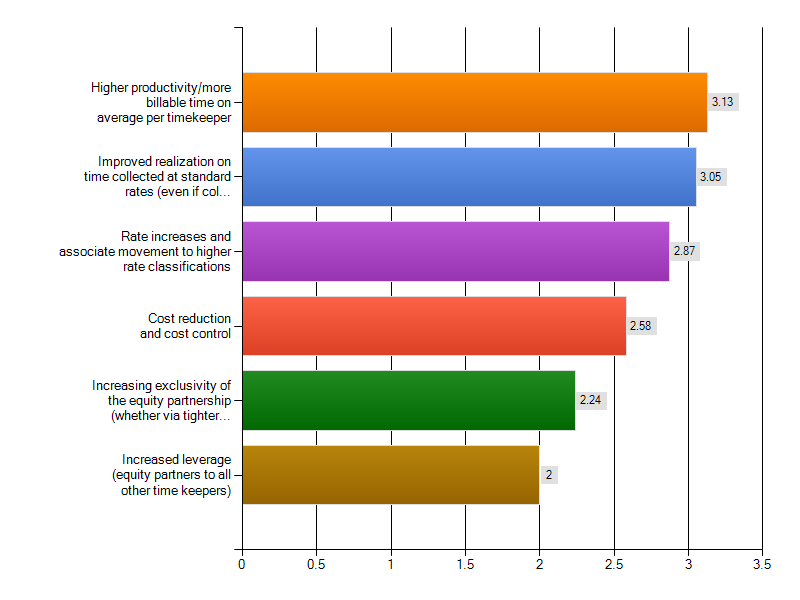 This month we looked at law firms’ plans relative to profit improvement. Specifically, we asked law firm leaders which profit drivers they planned to use to improve profitability at their own firms over the next few years. 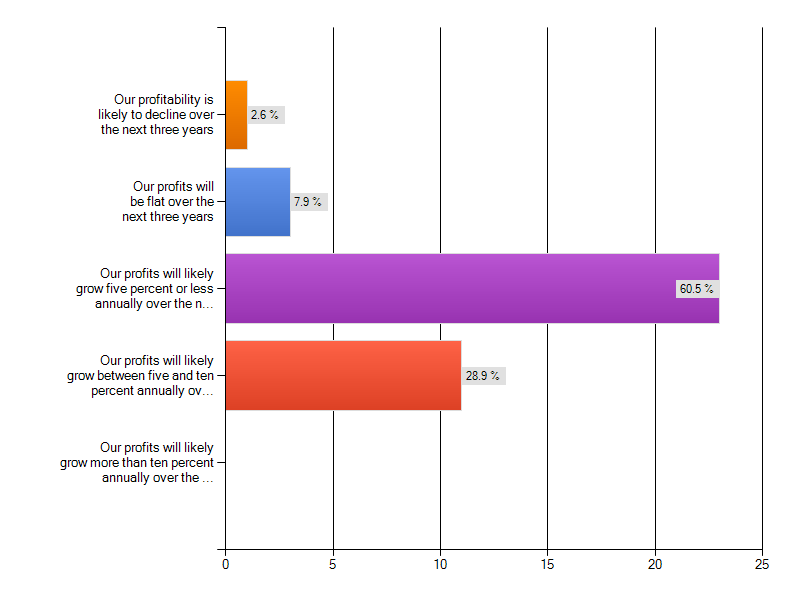 We also asked each to share his/her expectations regarding profit growth in the next three years. Starting with expectations, we were pleased to see a measured optimism coming from the overwhelming majority of law firms. Only about 11% of firms expect their annual profits to be flat or declining over the next three years. Conversely, roughly 60% expect profits to rise modestly (i.e., less than five percent) annually each of the next three years. None, however, expect robust profit growth of greater than 10% annually. These findings represent a marked departure from profit growth strategies of the past two decades. In the 1990’s (and the late 80’s as well), leverage was considered something of a “holy grail” for driving profits – it is now the least preferred approach to growing profits. In the pre-recession years of the 2000’s, rate increases drove profit improvement. Rate increases are now a somewhat distant third – and are even less important among firms expecting the most robust (5-10%) profit growth. Tighter standards for equity partnership – including de-equitizations and wide-spread adoption of two tier partnership structures – were an important driver of PPEP across both decades. That strategy appears to have waned as well. As a profit improvement strategy, it rates nearly as low as leverage – and, over 20% of firms do not consider it to be a viable profit driver for their firm. Looking at the most optimistic firms responding to the survey (i.e., those expecting profits to grow five to ten percent annually) – and comparing them to everyone else – reveals that those firms are pursuing a somewhat different strategy. Namely, the most optimistic firms plan to put a much greater emphasis on improving realization (they rate realization as a strategy more than 20% higher than their peers in other firms). Since the questions made clear that alternative fee arrangements were one means for improving realization, AFAs could be an important part of the most optimistic firms’ strategy. More simply, the more optimistic firms may simply plan to discount less and/or write-off less time. The most optimistic firms were slightly less bullish on raising rates (compared to others), so those firms very well could be focused on charging (and collecting) standard rates. Given these findings, however, we plan to take a closer look at AFAs in an upcoming “strategy question of the month.” Thanks for participating and for commenting below. Our response rates continue to grow month to month (thanks again for that). We hope that continues to grow and we encourage you to share your experiences with your peers. Interestingly enough, the latest NLJ 250 survey was released over the weekend and they find non-equity partner ranks growing by nearly eight percent, while the equity ranks declined slightly.